Ivo Perelman, Matthew Shipp, Gerald Cleaver—at this point, the web of collaborations linking these three improvisers is almost too tangled to pull apart. Just for an idea: typing “Ivo Perelman” into Shipp’s Discogs page calls up twenty results, the well received Callasand Corpoamong them. Fifteen results for “Gerald Cleaver,” and twelve for Cleaver with Perelman. As a trio, we’ve heard them before on The Foreign Legion, plus in quartet with William Parker on Serendipity and with fellow drummer Whit Dickey on Enigma—all on Leo Records, the label that’s been such a welcome home to Perelman since the late ’nineties (forty-eight results on Discogs!). I’ll admit, while we’re in the midst of this recent sextuple release, that it’s hard to keep up with Perelman’s prolific output, not to mention Shipp’s. 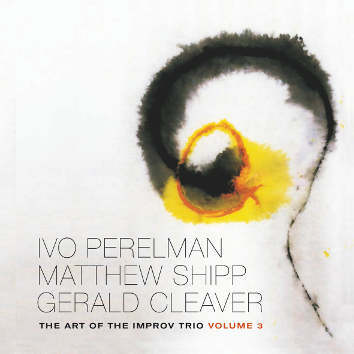 Which is why it’s so pleasing, when you do catch an album, to come across one as good as the third volume of The Art of the Improv Trio. 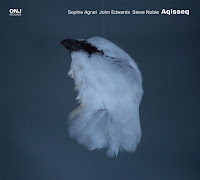 That said, we do cover as many of the Brazilian saxophonist’s releases as we can on the blog, and even as he continues to stretch boundaries, the common descriptors work fairly well here: there’s a sense of mystery, soulfulness, and poetry to the improvisations. Perelman’s playing is sublimely expressive, especially in his exploration of the altissimo register, where notes flit and then spill back down the tenor’s range. His control over the instrument—in part what makes his albums, with their varied range of collaborators, so consistently strong—is in evidence on each of these nine tracks. It’s hard to discuss each musician’s contribution individually, since throughout the album they’re almost always playing at once. In this context, Shipp’s playing demonstrates a kind of control in its relative restraint. 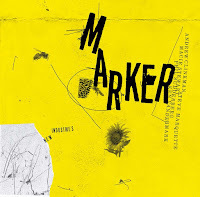 More than anyone else, he takes responsibility for setting the mood of the improvisations, whether with dark, crashing chords that plume out like fog or with ostinati that help launch Perelman into the ether. On one track, he even sits out entirely. Cleaver, meanwhile, proves exactly why he deserves his recurring role on these albums. Here he straddles the line between timekeeping and open playing, sometimes implying a groove, sometimes cracking out backbeats. He can swing hard or patter around quietly. Fellow drummers will enjoy turning up the volume to appreciate the richness of his drum sound, especially in his two solo spots. Anyone hesitant to commit to all six volumes of The Art of the Improv Trio or unsure where to make your approach—I encourage you to give Vol. 3 a try. “Flow” is the term my writing students usually use when they want to talk about development: your essay really flows! 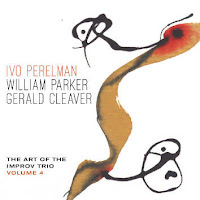 But when—in his notes for The Art of the Improv Trio, Volume 4—William Parker observes that “[t]he music must flow without effort and without preconceived ideas, just the eternal now,” I tend to listen up. Because while I do often find myself conditioned to tracking (or superimposing) structures of development within (or onto) improvised music, many times, as in this fourth installment of Ivo Perelman’s recent batch of Leo releases, “eternal now” seems an apter description. 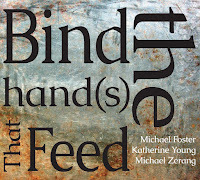 It’s predetermined, controlled structural development—from verse to chorus, from A to A to B to A, etc.—that risks habituating the listener and deadening their response. Without that predictability, we lose our comforting reference points and in turn must pay equal attention to every shift, remaining as present as possible alongside the improvisers. 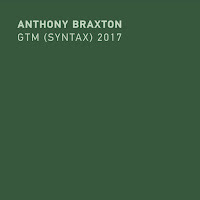 Especially in Volume 4’s forty-minute centerpiece (bookended by two six-minute improvisations), these kinds of shifts do make useful signposts—the early breakneck swing decelerating to a more moderate tempo; Parker’s brief, methodical solo; the loose Latin feel that gathers afterward; the closing groove. But this synopsis fails to capture the energy of the trio’s dynamic interplay, which effortlessly keeps the music constantly refreshed. Indeed, Parker’s “flow” calls to mind vital activity, the instinctive pumping of blood through veins. 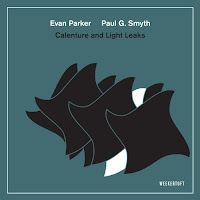 Moment to moment there’s a productive, good-natured tension between each musician’s approach, as when Parker and Cleaver keep time simultaneously but at different rates, or when Perelman sets his altissimo against Parker’s arco. That the improvisation comes to a close with the three improvisers uniting around an infectious groove may invite a reading of resolution, a solving of the album’s beautiful chaos. But such a linear reading would seem to have little to do with the flow of the music, from one now to the next. Unfortunately, the Volume 3 recording is marred by some serious static cracks, fluttering, and pops that appear at the end of "Part 2". At the end of Part 2 Parker makes some percussive noises on his bass which could possibly be mistaken for defects on the CD. But in fact there are no cracks and pops, at least on my CD.